When sibling rivalry brings you to your wits end, you know something has to change. But what do you do when you are committed to raising your children with respectful parenting practices? When you believe that punishing children for their poor choices is not the way forward for your family and yet nothing else you have done works, it can make you feel a little desperate. 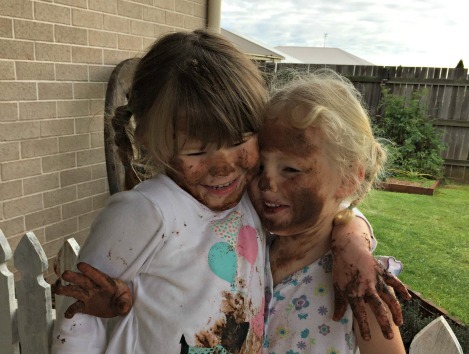 Sibling rivalry in our household has been a long-winded, drawn out affair between my two girls aged nearly three and nearly two. L has had a hard time accepting her sister, P, into the family and demonstrates her hardships through acts of aggression and extreme emotions. This has meant we have needed to provide constant intervention in their daily struggles as we have aimed to prevent physical acts of aggression and sportscast most other battles. It has recently become apparent to me that our ongoing involvement in their affairs has limited the space our children have in which they can forge their own relationship. Sure, we have seen snippets of a little sibling relationship emerge from time to time, little previews into what might eventuate on a more permanent basis in the future. But I have been left wondering whether their true sister – sister relationship is being somewhat stifled by our constant interference in their interactions with each other. Currently, much of the girls’ communication comes through my husband and I as we translate their ‘words’, shouts, actions and inactions to each other through a method known as sportscasting. As P screams and holds tightly onto her doll whilst L tries to take it from her, I translate with “L, it looks like you would like that doll. P, you’re telling L you haven’t finished playing with it yet”. Now, this is my interpretation of the situation. Obviously I am only guessing what each of the girls are thinking / telling each other in these scenarios and there is always a chance that I am off the mark. L, for example, may not want the doll at all, she may just not want P to play with it. P might be wanting to tell L more than that she hasn’t finished playing with it. She may also wish to let L know that she is frustrated that she keeps taking her things, that she wishes she would leave her alone or that she will in fact be finished using the doll soon and will happily give it to her then. Who knows, maybe they both enjoy the tussle and the drama created. They might like that it brings me running and ensures they both have my undivided attention. I sometimes feel as if our verbalising of the girls’ communication throughout the day has limited their opportunity to fully express themselves to each other and work each other out and has hence restricted the development of their relationship. With P being pre-verbal and L not always able to articulate her thoughts succinctly, it is obvious that this level of expression is not likely or even possible at this stage in their lives but I have often wished that I could take a big step back and allow them try to interpret each other for themselves. I don’t want to be a part of their relationship. I want it to grow uniquely with each other without my involvement. Unfortunately, with the continual risk of physical altercation and P’s developed sensitivity to L’s outbursts I have not been able to give them their due space…until now. In my last post I detailed how I experimented with punitive discipline to help ‘cure’ L of her incessant attack on P, with disastrous results. Life in our household has been downright miserable and I knew after that I needed to find a respectful way to help the girls on their way, without needing to resort to punitive punishment. I am currently reading Raising Your Spirited Child: A Guide for Parents Whose Child Is More Intense, Sensitive, Perceptive, Persistent, and Energetic by Mary Sheedy Kurcinka and I am learning a lot. In one of the early chapters in the book it talks about introverted vs extroverted children and the differences in the needs of these children. Both of my children have introverted tendencies and one thing it suggests is that the introverted child needs to be given opportunities for alone time periodically to recharge and regroup. They say that a decline in behaviour when they are around other children for extended periods can be a cry out for space. So, I took this on board and have begun to make a more conscious effort to give the children time to play on their own. I look for signs that they need a recharge and then, depending on the situation, offer ways for separation. Now, I know this sounds like interference and I guess it is, but by allowing them the space they need, they are able to find their own equilibrium before coming back together for extended play without the constant need for hovering supervision. To assist the process somewhat, over the past few weeks we have turned L and P’s bedrooms into little sanctuaries. We wanted to give them a relaxing space with some books and quiet toys, an inviting bed and access to soothing music. Their rooms needed to be a place they could enjoy being in throughout the day, not only for sleeping. These rooms are their own and are the only places in the house where I will respect their directives to not have anyone else around them. I.e. if L is in her room and doesn’t want P in there, I will remove P as she wishes and vice versa. This is a space they are free to vent with support and also a retreat for them when things are becoming too much. So now that they have these spaces, I have changed my interactions with the children during their struggles. My first rule is that any physical act of aggression indicates to me that they are in need of time apart, regardless of the situation. It seems like a natural consequence to me that if there is violence in any form, they are removed from the situation until they feel more in control of their actions. I will state “You are having a hard time being around X, I will take you to your room so you can have your own space.” I will then help them to their room and let them know they are welcome to come out whenever they feels ready to come back and play. Often, if there seems to be more to it, I will offer to stay and connect but I usually read each situation separately. For other instances, I listen and observe. I determine whether the struggle is minor and seems to be within the realm of their capability to solve it themselves. I am not afraid of short, sharp shouts of protest with struggles over toys. Normally a minor altercation is over within seconds. If the shouts become prolonged or they both have firm grip on an item, I move closer and start sportscasting. “You both have the doll. I will crouch between you.” I have to do this in these situations because they now have a similar holding strength and L will often use her free hand to dig her fingers into P’s gripping hand to reef it from the object. This hurts P so I can’t allow it. I gently move L’s hands away in this case and let her know that I won’t let her hurt P.
Once the altercation is complete and there is an outcome one way or the other, I acknowledge their feelings and then let them know that if they need space they are welcome to spend some time in their rooms. Following this, if there are more struggles in quick succession I thank them for letting me know they need their own space and tell them that it is time to go to their own rooms to play. They can then (if they wish) choose a toy to take and make their way there. There is no set time limit for how long they stay in there. It is just until they naturally gravitate back to each other. If they come together too soon and they are still having troubles then I offer them time apart again. Sometimes I am able to use these separation periods to spend a bit of quality time with one of them. I normally gravitate towards the one who seems to be having the hardest time and offer them a cuddle. Now, I have to admit, these separations have not always gone smoothly. Particularly in the beginning there was a lot of protesting when I enforced separation. I have always been very careful to acknowledge these feelings and offer the necessary support. Now, once they have been separated, the girls will play contentedly on their own for long periods of time without even wanting to come back together. And when they finally do, I see much less struggle between them which means I have been able to take that step back from them that I have been wanting. It is like they are able to recharge, bring themselves back to a centred state and subsequently feel more at peace with each other when they are reconnected. It has been nearly four weeks since we first started offering time for separation throughout the day and the girls have turned a huge corner in their relationship. There are days now where the girls play delightedly with each other for upwards of an hour at a time without a single word from myself or my husband. I no longer panic when they are together, out of my vision, in another area of the house. They happily play in each other’s rooms but are both confident in letting the other know when they want them out (which I am still happy to enforce). They both seem more content somehow and although we do still witness daily spats, they are not a patch on what they have been for the past eighteen months or so. The need for me to separate the girls is now much more rare than it was four weeks ago as they are naturally taking themselves to different areas of the house to play periodically throughout the day. The RIE parenting approach advocates for allowing children to work through their struggles in their own time and in their own way wherever possible. Another piece of advice presented to RIE parents is to provide a safe play space for young children such that they can play happily and comfortably without the constant need to hover. It seems that I have finally been able to implement these two strategies with huge success. 1. Transforming the girls’ rooms into a relaxing space with just a few prized toys, a cosy nook for reading and access to soothing music. 2. Not treating this time apart as a punitive punishment. This is not a time-out with a minimum sentencing period. It is simply recognising that the children need their own space at times and providing them the opportunity for that. 3. Connecting with the children whenever necessary so they never feel abandoned or alone in their rooms. If they come to associate being in their room as a negative experience they will be much less likely to see it as a retreat. 4. 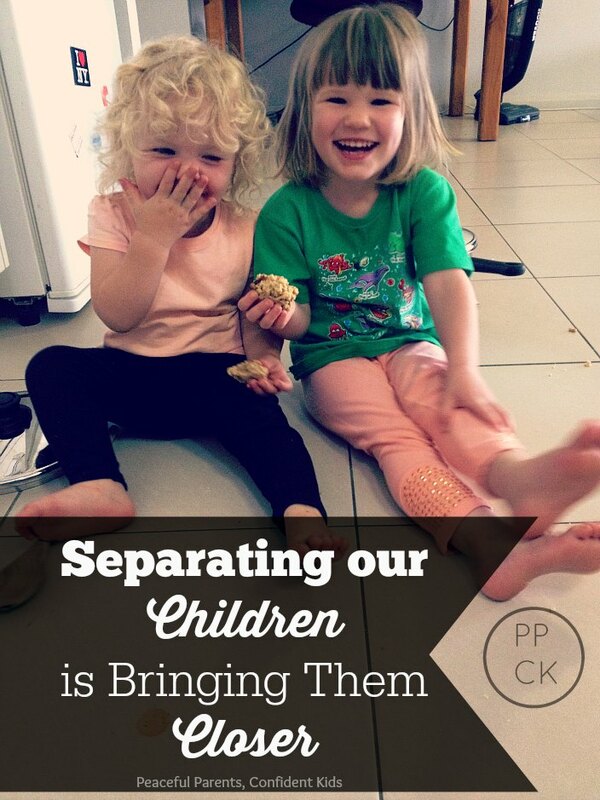 Always being respectful in tone, temperament and words when talking to them about needing separation time. Edited (Feb 2016): My daughters are now 4.5 and 3.5 years. When I read back over this article recently, I realised that separating our children in this way was such a turning point in our daughter’s relationship. We have never looked back. Finding a way to support the girls in their need for space and down time was the missing link we were searching for in truly allowing them to grow together authentically and lovingly. The relationship they enjoy now is truly special. They are best buds. They play together all day. They comfort each other, they stick up for each other and they are learning to be considerate of one another’s needs. We no longer separate the children when they argue because they are now capable of talking through their spats themselves and assertive enough to seek their own space when they need to. I really enjoyed this article! Definitely something I will be keeping in mind, I love the idea of bedroom’s being places to recharge! I enjoy your posts. Thanks. I don’t mean to imply that this is all ‘your stuff’ but I think our children come along to teach us and show us where we need to heal ourselves. So it’s also always something to consider how the little ones are reflecting our own issues that come from the experiences we had in our own lives. I think when children repeatedly do something the most effective method is to look to see where that is also our own stuff – and then find our own healing. It’s quite astounding how their behaviour shifts when we have healed that thing in ourselves. Great point! Children do pick up on so much more of us than we think we are showing. Something to be mindful of in the future! Thank you. Thanks for being open to it and not offended. 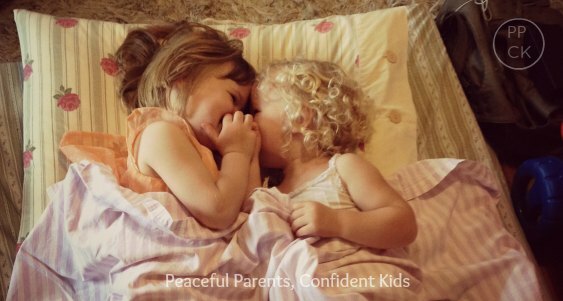 Its difficult not to be defended when someone tells us anything about our parenting. I does seem like there are times when an adult needs to intervene and act as a liaison between siblings. I have four children, and for the most part they get along. Recently, I have taken myself out of the “after-dinner chore” equation; allowing them to plan, negotiate, and complete the tasks on their own, between themselves. At first, I could see where they were strongly adhering to the former rules and chore divisions I had set for them (for example, one washes, one rinses, one dries, one sweeps, etc.). After some time though, they have been negotiating their own terms. One of them actually agreed to wash for a week if another did it for a particular night. Of course there are disagreements, and these seem to present great opportunities to give them the tools necessary to solve these disagreements on their own (sometimes even by just flipping a darn coin!). It’s hard though, sometimes, not to resort back to the old parenting methods when they start the arguing. Then I just remember to breathe… then respond, rather than react! I love that idea of having the children work out and negotiate who will do which chores! Such great, real life skills to be learned from that scenario. Intervention by an adult is definitely necessary for many conflicts. I am just hoping that I can give my children more chances to work through things themselves now with the tools I have given them. I have been experiencing similar aggression issues and I have a 4,3 and 1.5 year old. My 3 old does not respond well to sportscasting attempts. I think she feels mocked. My 3 rarely retreat to their own space and it’s only been punitive. You know how counterproductive that is. I like your suggested language and idea for some room time. Thanks for posting! Thank you, Amanda. My two would never retreat to their rooms either previously. It was like they didn’t know how to be alone. They are much more open to it now so hopefully you will find some success too. I love your idea, but what would you do if you didn’t have separate rooms for them? My DD4.5 and DS-almost-3 share one very small room. My daughter is the extrovert and absolutely HATES being isolated in any way, especially from me. My son is an introvert and often happy to play alone, but I don’t want it to feel like I’m always ‘putting him out of the way’ or something. We have a lounge – dining-kitchen configuration of rooms (3 rooms joined by archways) and I guess I could make them each a little space in the lounge and dining, but they wouldn’t really be all that separate. I do try sometimes suggesting one come and help me and the other do a different activity, or get my daughter to sit up at the dining table and draw, under my supervision, while my son plays in his room. But it doesn’t usually work that well. What would you do in this case? It is much more difficult when the children have shared rooms as it is less authentic to them if you suddenly divvy up space in neutral territory that is to become only theirs for a period of time, especially if they have both been playing in it for the past three years. I would probably let them know that you can see they need time apart and they need to choose one toy or book and take it to a space of their choice either bedroom, lounge or dining etc. One thing that has really helped keep the separation of my girls extended for longer than 30secs has been the music I put on in their room. My 3yo in particular finds the music alluring and therapeutic so if you could somehow have some music playing in the spaces during the separation time you may have more luck. Sorry, I cant be more help. Another wise post. I appreciate your insight into the ways of kids to help when other methods just aren’t clicking. Wonderful words to help guide me to do more of the same. Sportscasting has helped my newly 5 and newly 3 year olds jive better, but still have moments. Thank you for also showing its integration in Raising Your Spirited Child. I have read it too, but I think I needed refreshing on that. I do wish you may share more sometime on if you deal with “drama.” You touched on it briefly like if she really wants it, or does she simply not want her to have it. And all. the. associated. tears. and yells. Ugh. Do you find sportscasting works amid that? I haven’t. Would love to know what you do after the “storm of emotions” stops. Thanks again for your excellent blog. I keep sharing it! Usually when Lucy takes things from Penny it is because the item is genuinely hers or she is interested in it. These are the times when sportscasting works and gives them the opportunity to work out how they can both be satisfied with the conclusion. There are definitely times, however, when Lucy’s mood deteriorates and her taking things becomes a form of limit testing or animosity targeted at her sister. I will still sportscast but my wording will change to something like “Penny, you were playing with the doll and now Lucy has it. Are you telling Lucy you hadn’t finished with that doll? Lucy, you seem to be having a hard time letting Penny play with her toys. I am going to help you give the doll back.” At this point I will try to determine the cause of her mood eg tiredness, hunger or needing separation and endeavour to help her. Once the storm of emotions stop from both children I will sometimes let it be if they both seem content in the conclusion they reached but sometimes I might use it as a learning experience for them and say something like “You girls both felt very strongly about wanting to play with that doll before. I am pleased you have been able to work it out. Perhaps next time Lucy, you could ask Penny to let you know when she’s finished with it so you can have a turn…. Does this answer your question, Mitch N Sherra? I have a 3 yo daughter who is a strong introvert, and after reading “Raising Your Spirited Child” and “How to talk….” realized that she needs time alone to recharge. As an introvert myself, I can totally understand the need. We live next door to my husband’s sister, who has two young daughters, one of which is extremely boisterous and aggressive. I’ve taught Lily that it’s okay to say “I need to be alone” when she’s feeling overwhelmed by her cousin. Now that the cousins have gotten used to the concept of “being alone” it’s fun to hear them use the term when they need time to recharge. My most favorite thing is that sometimes one cousin will say “I need to be alone” and another will say “can I be alone with you?” If the first cousin says “yes” oftentimes there will be 3 girls “being alone” together. Also, I’m curious if you’re familiar with Thomas Gordon and his Family Effectiveness Training/Parent Effectiveness training? I’ve read his “Parent Effectiveness Training” and see alot of similarities between his philosophy and what I understand of the RIE method. Thank you for this article. It would be great if you could please shed some light on what you might do if the victim and perpetrator roles have already been set up (even if you didn’t mean to do it!). My son (2yrs) is much more physical and aggressive than my 4 year old daughter and although they do get along a lot of the time, I feel that she now just falls back on the victim role instantly when confronted with him – crying or mewling, just staring at me for help when he gets aggressive (he has bitten and will hit), or even when he’s just being an annoying little brother without aggression, whether it’s because he wants to play with her and is still figuring out how to get her attention or just is feeling mischievous. I try to set firm limits while empathizing with her and getting her to say in words why she doesn’t want him to do what he’s doing (which works sometimes) and teaching him better ways of asking to play… (And have removed him from the room sometimes for some quiet time with Mummy). But I would love to see her to not assume the victim role so quickly. She is a very confident outgoing little girl otherwise. If the roles have been set up already, it will take a little while to neutralise them but it will be worth it and important for both the children and their relationship. The best thing to do whenever possible is to be there to block acts of aggression before they occur. This removes the opportunity for one to be the aggressor and then for the other to be victim. I know (from personal experience) that this is not always possible so in the cases where there are acts of aggression here are my tips. 2. Move over to the area and tell your son. It is not ok to hit. Try not to say things like you hurt sister or that’s naughty or anything that induces guilt, shame or implies blame. Remember, your son is not developmental ready to fully understand the impacts of his actions. There would undoubtably be some very rational (to him) reasons for doing what he does and he needs understanding and guidance rather that blame, guilt and punishment. 3. Talk to your daughter and ask her if she is ok? If she seems upset you could say “you didn’t like being hit, bitten”. Then allow her some time to process and recover. She does need to know you are there to support her if she is genuinely hurt or upset but she doesn’t need to be removed and helped any more than that as that reinforces the victim role. Whenever possible, leave them be to work through their differences (ie when it is non physical). It can be uncomfortable but I normally tolerate a small amount of raised voices and whinging before I feel they need some (minimal) input from me. I may say I hear you are both upset. Can you work it out yourselves or do you need my help? Or I am going to give you a little bit of time to work through this yourselves. If the bickering continues for long stop start periods and it is clear they need some space from each other, that when I offer them separation or enforce it. Staying neutral is the key here. Once you stop perceiving your daughter as the victim and son as the perpetrator, you will naturally bring about changes in dealing with them and therefore help them get past those roles. Thank you, yes the keeping calm and neutral bit is my biggest problem probably! Some days are definitely better than others. I like how you say that once I stop seeing them with these labels it will naturally stop; as my attitude towards them will change as well. I can definately work with that! Thanks again.